← New Curtains from Old Fabrics for a New Home! A question I’m asked most often by beginner sewers, however, everyone could learn something here. TACKING – use a bright colour so that you can easily see it to remove it, ideally something weak that you’ll be able to break without too much effort! 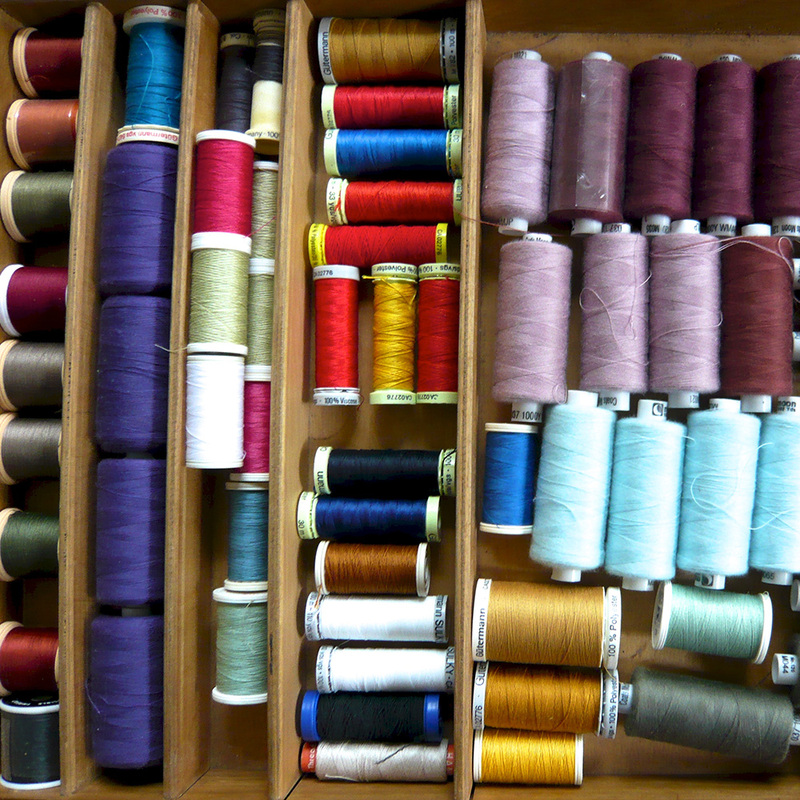 I often use the cheap unbranded threads sold in sewing shops, reels of old sewing thread that are no longer suitable for machine sewing or any 100% cotton thread, even old bits of unused cotton embroidery floss. REGULAR MACHINE SEWING – use only branded sewing thread, look for brands such as Drima, Coats, Guterman, Moon. Using cheap unbranded threads in your machine will lead to snapped threads, tangles in your machine and tears! TOPSTITCHING – choose a thicker topstitching thread from one of the brands mentioned above to make your topstitching stand out. Rememberto only use the topstitching thread on the needle, use a matching colour regular sewing thread on your bobbin. HEAVIER WEIGHT FABRICS – when sewing fabrics like heavy denim, canvas, oilcloth, lightweight leather or fake leather, you need a slightly thicker, stronger thread. Most of the branded thread companies have a thread in between the regular machine sewing and topstitching threads – often called upholstery thread. Sometimes you might be able to also use this on the bobbin, but test it first. If your bobbin stitches come out loopy and unbalanced use a regular sewing thread on the bobbin. FINE LIGHTWEIGHT FABRICS – you can buy extra fine and silk machine sewing threads. Again, most of the brands mentioned previously will have their own versions. Personally I would only choose this for something super special, otherwise a regular sewing thread will do the job and will be stronger. What about fibre content? If I’m sewing cotton should I use cotton thread? Strictly speaking, if you’re sewing a natural fabric, you should use a natural sewing thread. Personally, I always use polyester as it’s stronger. Cotton thread can dry out and become brittle and weak, but in the world of patchwork and quilting there is the theory that if your sewing thread is weaker than your fabric, better for the thread to break rather than your fabric to rip as it will be easier to repair and the fabric is more precious than the thread. Another thing to bear in mind – if you want to dye your finished product and you’ve used synthetic sewing thread, it won’t take the dye. What if I can’t find a thread colour that exactly matches my fabric? Always go a shade darker, lighter colours tend to stand out and come to the foreground and so will be more obvious on your fabric. Darker shades tend to recede into the background. This entry was posted in Buying Guides and tagged choosing sewing thread, learn to sew brighton, miy workshop, sewing classes brighton, sewing thread, Wendy Ward, which sewing thread to use. Bookmark the permalink. I am now in the habit of un-winding bobbin ends onto old gutterman spools and use these for tacking and handsewing. my husqvarna bobbin does not always stitch to end so there are often leftover bits. Good idea, I occasionally feel I should do this! !